Yes, the i1Match software used with i1DisplayLT, i1Display2,and i1Pro's including Basic and XTreme has been tested and is supported on Windows 7 32/64x systems. You can find more information at our Windows 7 Support Matrix. If you have installed a previous version of i1Match, you may run into some connectivity issues in Windows 7. Please make sure that you are using version 3.6.2 to ensure compatibility. Some security features that Microsoft has incorporated on their operating system, like Windows Defender and UAC (User Account Control), can prevent your hardware from being recognized on the system and in the software. The following links will walk you through shutting these settings off on your computer if you need assistance. User Account Control (UAC) After shutting off the UAC your computer will force you to reboot so you may want to shut that one off last. Once the computer has rebooted try to reconnect the i1Display/i1Pro to your USB port which should now allow the driver to install automatically. You will notice a prompt on the bottom right hand side of your screen showing that the driver is installing, allow this process a few moments to complete. Launch the i1Match and see if you are able to connect. 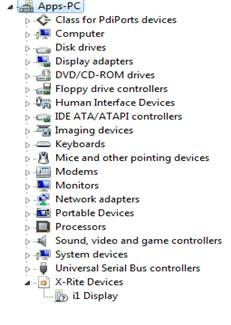 If for some reason that driver didn't install you can do this manually but going to Start > Control Panel > Device Manager. With the i1 hardware still plugged in you should see X-rite Devices listed in the devices pane and under it the i1Display2/i1Pro, it may have a question mark next to it which is an indication that it was not installed properly as you will see in the image below. Right-click on i1Display2/i1Pro and select Update Driver Software > Search Automatically. Allow this to complete and then re-launch your software. You should now be able to connect properly and continue through the profiling process. You may notice that the question mark is no longer visible and your driver was successfully installed.